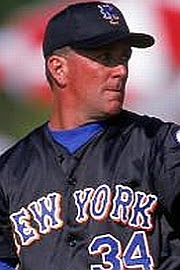 Dennis Leroy Springer was born February 12th 1965 in Fresno California, the hometown of Tom Seaver. 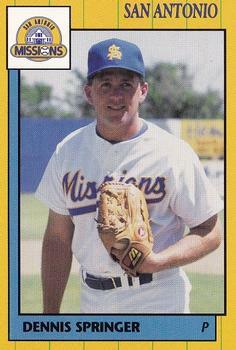 He was one in a long line of Major league players that attended California State University at Fresno. He was drafted by the Los Angeles Dodgers in the 21st round of the 1987 draft. The five foot ten, right hander's specialty was his knuckleball. He would spend seven years in the minors before making to the big leagues. By that time he was with the Philadelphia Phillies debuting in 1995 going 0-3 in just four games pitched. He then signed on with the California Angels playing there for two years into the transition of the team being called the Anaheim Angles. In two seasons there he posted ERA's near six & went a combined 14-15. He allowed the second most HRs in 1997 (32) & was fourth in the AL in earned runs with 112. He did throw a shut out in each of his seasons in Anaheim. In 1998 he was drafted by the new expansion Tampa Bay Devil Rays as the 25th pick. Unfortunately he had a terrible 3-11 season inaugural season there. He moved down state to South Florida where he signed with the Florida Marlins getting a spot in their rotation. In a career high 38 games (29 starts) & 196 innings, he went 6-16 (second most losses in the NL) with a 4.86 ERA. In the winter of 2000 the 1999 NL Wild Card Champion Mets signed him & gave him a shot. Springer debuted with the Mets on April 22nd, starting the second game of a double header at Shea Stadium, against the Chicago Cubs. He went into the 6th inning, giving up three runs on seven hits earning no decision, as the Mets did go on to a 7-6 win thanks to a five run 6th inning. The knuckleballer got one more start, coming on April 26th but it was a debacle. He allowed eight runs on thirteen hits with four walks in just six innings of work, taking a 12-1 loss to the Cincinnati Reds. He went 5-5 with the Mets AAA Norfolk Tides that season as well. Overall he spent 15 seasons in the minors going 24-48 with a 3.33 ERA. 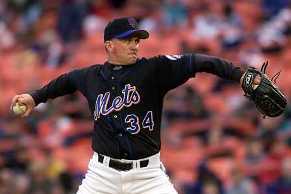 The Mets let him go & he appeared with the Los Angeles Dodgers pitching five games over the 2001 & 2002 seasons. In his big league career he was 24-48 with a 5.18 ERA, 296 strike outs & 258 walks in 130 games (98 starts). Trivia: In 2001 he served up the San Francisco Giants Barry Bonds his 73rd HR of the season.